Dr. Joanne CulverhouseLocal sports fans attending the Sugar Bowl or any March Madness basketball games in the coming season may be surprised to see the face of a local luminary: Laguna Beach High School principal Joanne Culverhouse.In spring, Thurston Middle School math/tech teacher Andy Crisp entered a video about Culverhouse in a contest sponsored by the web site Zooppa for the Buick Human Highlight Reel Competition. In recent weeks, a Buick representative contacted Crisp for his permission to use Culverhouse’s story in a print ad for the Sugar Bowl and upcoming NCAA March Madness games. Buick devised the competition to show that NCAA athletes are about more than points and playoffs. Contestants were required to submit a mini-documentary, up to 60 seconds long, about a former NCAA athlete’s experience on or off the field that caused them to take action. In the film, Culverhouse describes a life-changing experience as an NCAA athlete, who played basketball, volleyball and softball at the University of Nevada, Reno. A coach told Culverhouse that as a result of letting her grades slip, she jeopardized her scholarship and could be banned from the court and field. The wake up call, “really helped me understand how important it is to put academics and athletics together,” admitted Culverhouse in Crisp’s video. 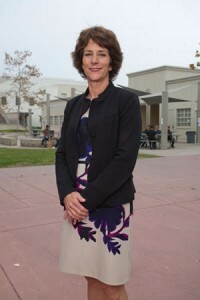 She turned it around and went on to teach fourth and fifth graders for 11 years, earned two masters degrees and a doctorate from UCLA. Crisp had entered an earlier video contest sponsored by Zooppa, since the site gives amateur filmmakers a chance to create commercials that might be used in marketing campaigns. Crisp’s earlier entry, a commercial for Hormel, did get picked up. So when Zooppa announced the Buick competition, he decided to try his luck again. Culverhouse, Thurston’s former principal, seemed an obvious subject, in part because Crisp knew she filled the requirement of being a former NCAA athlete. More importantly, “I felt that I could tell a compelling story about the impact she has had on thousands of students in Laguna Beach,” said Crisp, who described Culverhouse as an inspiring leader. He knew her story would hit home. Crisp and Culverhouse shot the video over two days, with the help of some students. He edited it and submitted it in time for the March 30 deadline, and it can now be viewed on Youtube. “She certainly deserves this recognition for her accomplishments as a college athlete in three sports, but most importantly for her positive impact on hundreds of students,” said district Supt. Sherine Smith, who also recognized Culverhouse at last week’s board meeting. Ms. Culverhouse is the most intelligent, enthusiastic and caring person ever associated with the 3 lads I have had go through the Laguna Schools! My hat is off to her, as off as off can be! In fact it’s so far off I can’t even find the darn thing!